Today I started off trying to install wall panel P2 because I thought it would be the easiest. It doesn’t have any windows or electrical behind it, and I only plan to mount the medicine/zombie ammo cabinet on it. But then we realized that cabinet needs to hang at the same height as the mirrored cabinet over the sink, on the opposite wall. And that mirror needs to be higher than the wall panel itself. Those cabinets need to hang from the ceiling corner panels, which haven’t been bent yet. So, I switched gears and started removing some of the dry-fit on the starboard wall. All the cushions, the base cabinet and the wall panels that were just taped into position. Then I measured out the placements of the four porthole window cut-outs on that side. And then I had an epiphany: After many sleepless nights trying to visualize how things may or may not play out, I reminded myself that many things in life ultimately may seem impossible, difficult, or not worth the effort up front. Until, that is, you bite the bullet and strike up a little determination and momentum. And it’s that momentum that will carry you through the most daunting of tasks. I measured out the outer wall holes evenly spaced from the inside, after starting over at least three times. I based everything on the smallest wall cavity, and simplified all the offsets at 2″ using a carpenter’s square. Then I drilled 16 1/8″ pilot holes from the inside out. 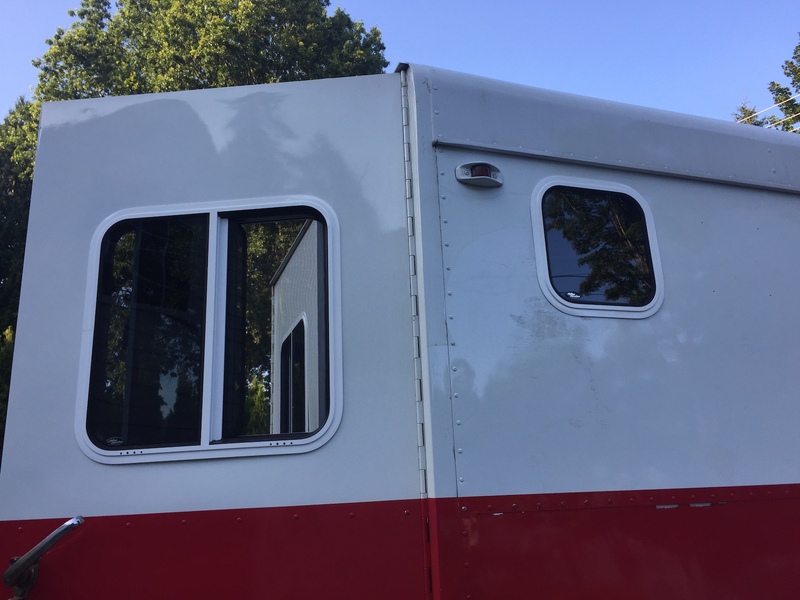 From the outside, all I had to do was verify they were all within 1/16″ of plumb from the nearest visual reference, which happens to be the rain gutter running along the top of the RETROvan. That tolerance ultimately doesn’t matter because I’ve learned the 6″ hole saw is pretty sloppy. 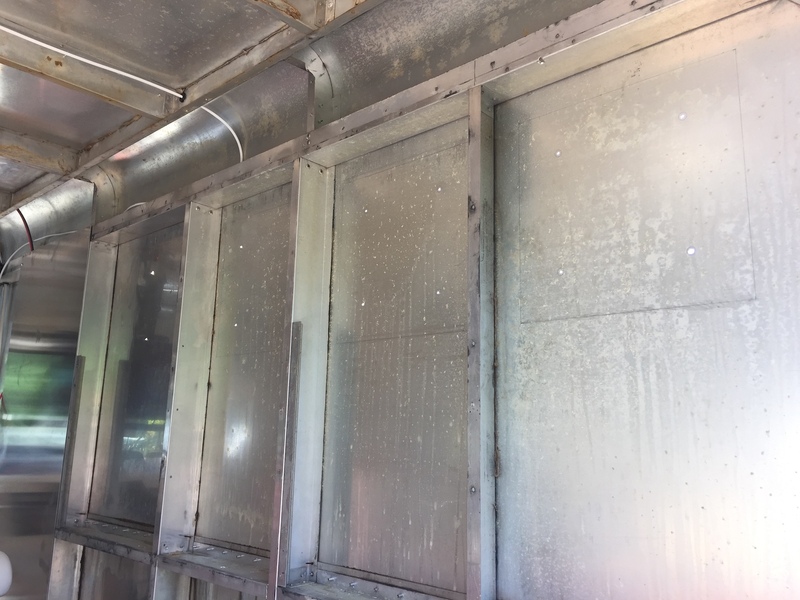 And, that slop is readily covered up by the inner and outer window flanges, so it really doesn’t matter since the final fit of the windows are reasonably adjustable. The trick is to not draw tangents directly on the rather ragged corner holes, but rather re-scribe them from the inside-out and adjust the jigsaw cuts to bring the supporting edges back into line. This is super important because when I re-measured the windows, I noticed the outer part is 1/8″ smaller than the inner trim ring. Motion Windows just assumes your walls are solid wood (or whatever material), and that you can just use a shim to compensate. That’s not going to work in my case. I need the inner and outer aluminum wall panels to support their fair share of the window assemblies in level fashion, without shimming. Here’s the first porthole window, dry-fitted into position. There will be three more holes to its right. The inner wall panels haven’t been cut yet, and that’s the next challenge. Hopefully I can do that with some careful measurement transference and cutting on a flat surface over some scrap plywood. That, because I don’t have access to an NC plasma cutter. But, this part was easier than the back windows because there was no inner wall panel to bang against when cutting. So everything now depends on reference points, and keeping the number of those reference points to a bare minimum. That means I’m securing each wall panel with only a single top corner screw for now. The rest of the screws can go in once I’m sure that whole panel is in alignment with its window and ready to commit.